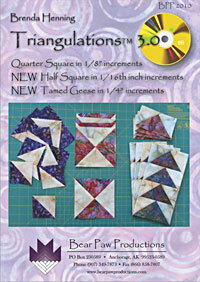 Half square triangle foundations are now available in sizes ½” to 7 ½” in 1/8” increments! Quarter square triangle foundations have also been added, in sizes 3/4" to 7 ½” in 1/8” increments! 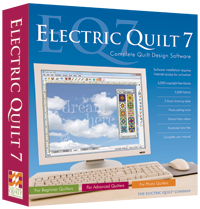 Two additional quilt patterns have been included for a total of 4 patterns on the disc. Formatted to fit standard 8 ½" x 11" computer paper. Print as few or as many as you need! Kaleidoscope Kreator is the easiest way to create beautiful kaleidoscopes from your own photos and images. Simply open a photo, choose a shape, position the photo in the template and CLICK! Kaleidoscope Kreator is the perfect tool for quilting, scrapbooking, papercrafts, and so much more. Over fifty different templates. 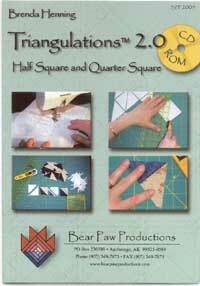 Print wedges separately for making quilts using traditional piecing methods. Kaleidoscope Kreator 3 has been completely redesigned from the ground up to make it faster, easier to use, and packed with features that our customers asked for.